Hayes’ Sydney McMillin (12) dribbles around Central Crossing’s Lilly Dimmerling during the first half of Monday’s Division I district tournament opener in Delaware. 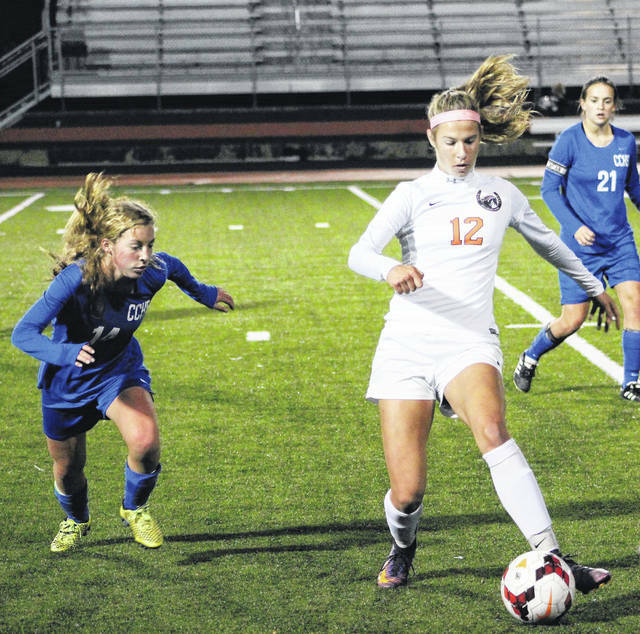 The Central Crossing girls soccer team had all the momentum heading into overtime, scoring a pair of second-half goals to erase a 2-0 deficit in Monday’s Division I district tournament opener in Delaware. The host Pacers, though, couldn’t have cared less. Grace Miller buried a cross from Sydney McMillin into the back of the net just 56 seconds into the extra session to help 19th-seeded Delaware Hayes survive and advance. The 3-2 win sets up a showdown with the 16th-seeded Monarchs, who had a first-round bye, Thursday in Marysville. The game was a thriller … but it didn’t always look as though it was headed down to the wire. Both teams took turns possessing the ball in the first half, with some good looking chances stemming from the solid stretches. The Comets’ Kennedy Edwards and Hallie Fryman took turns peppering the net with less than 15 minutes left in the first half, but Pacer keeper Abby Weller was up to the task, pushing the ball over the crossbar with leaping saves on both occasions. Hayes’ best chances, at least in the first half, came in transition. None of them connected, though, until a centering pass found McMillin’s feet deep in the box. Central Crossing keeper Brittany Hanson stopped the sophomore’s initial point-blank shot, but McMillin collected the rebound and slipped it into the goal with 12.4 seconds left in the first half. The Pacers doubled their advantage less than two minutes into the second half, when McMillin sent a centering pass through the box to a waiting Payje Wilson, who took care of the rest. The Comets got on the board with 23 minutes to play and scored the equalizer with 10:32 left. The Barons spread the wealth in their tournament opener, getting goals from five different players on the way to a dominant opening-round win to start the Division II district tournament Monday in Delaware. Fifth-seeded Buckeye Valley got goals from Kennedy Wirth, Daelynn Rosser, Ellen Riley, Megan Hon and Selina Seliskar. Wirth’s came off a Hon corner kick and Seliskar found the back of the net off a feed from Aly Coburn. Next up, the Barons will take on second-seeded Big Walnut, which cruised to an opening-round win over Whitehall-Yearling Monday in Sunbury. The Golden Eagles were sharp to open postseason play, winning Monday’s Division II district tournament opener against the visiting Rams by a lopsided margin. Alle English finished with a game-best four goals while Adelee Gartner had a hat trick. Other multi-goal scorers included Kaitlin Meade, Emma Padgett and Anna Baldassarre, who scored two apiece. Grace Bodker, Avery Schone, Alexis Schone, Emily Neff and Erin Boehm each scored once to smooth out the scoring summary.